Plot Outline: The story of two animals and their adventures. 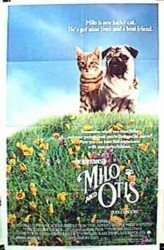 Milo, the cat, and Otis, the dog, are two animals who grew up together on the same farm. One day, the two are separated and begin a journey to find each other. The adventurous, and often perilous quest finds the two animals traveling across mountains, plains, and snow-covered lands searching for one another.